For the Disney attraction, see Buzz Lightyear (attractions). For the educational toy, see Galilean cannon. For the Transformers weapon, see Requiem Blaster. Astro Blaster is a fixed shooter arcade game released by Sega in 1981. It was designed and programmed by Gary Shannon and Barbara Michalec. Astro Blaster features speech synthesis technology; during attract mode a voice says "Fighter pilots needed in sector wars...play Astro Blaster!" The player controls a ship (bearing a resemblance to the Battlestar Galactica) which can fire and move left or right. The player must continuously monitor the onscreen temperature and fuel gauges; if the ship overheats, its weapon is disabled, and if it is depleted of fuel, the vessel itself explodes. The player must battle through waves of enemies, which attack with varied formations and flight patterns. When a wave is destroyed, a new one appears. At the end of each sector, the player flies through an asteroid belt and can obtain extra fuel by shooting fireballs. After this, the mother ship is met, where the player docks and refuels for the next sector. The player is rewarded for completing each of twenty-five undisclosed tasks (called "secret bonuses" on the cabinet's instructions), such as shooting all enemies in a specific order or shooting all enemies without missing. Astro Blaster is one of five unlockable games in the PlayStation Portable version of Sega Genesis Collection. In Sega's 2001 Dreamcast game Shenmue, an Astro Blaster cabinet is located in the YOU Arcade in Dobuita, but it has an "out of order" label on it and is not playable. 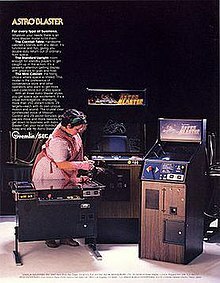 The current world record high score is held by Gus Pappas with 299,100 points scored on Astro Blaster on November 20, 1982 in Napa, California, USA. an unofficial port to the bbc micro was created by Richard braudhurst, retaining some of the synthesised speech while also supporting the ill-fated bbc speech cartridge. ^ a b c Hague, James. "The Giant List of Classic Game Programmers". ^ "Astro Blaster arcade video game by SEGA". Arcade History. ^ "Twin Galaxies' Astro Blaster High Score Rankings". Archived from the original on 17 December 2007. Retrieved 27 December 2009. This fixed shooter article is a stub. You can help Wikipedia by expanding it. This page was last edited on 16 April 2019, at 20:41 (UTC).